PHOENIX — Don’t expect Cory Remsburg to take anything — even a handshake — sitting down. This is the Army Ranger who did 10 tours in Iraq and Afghanistan, a total of three years and three months of combat. Shrapnel from a roadside bomb near Kandahar in Afghanistan left his speech slurred, his right eye blind and his left side partially paralyzed, but he’s walking farther and farther unassisted. He has no memory of what happened. It was Oct. 1, 2009. His father, Craig, got the call. 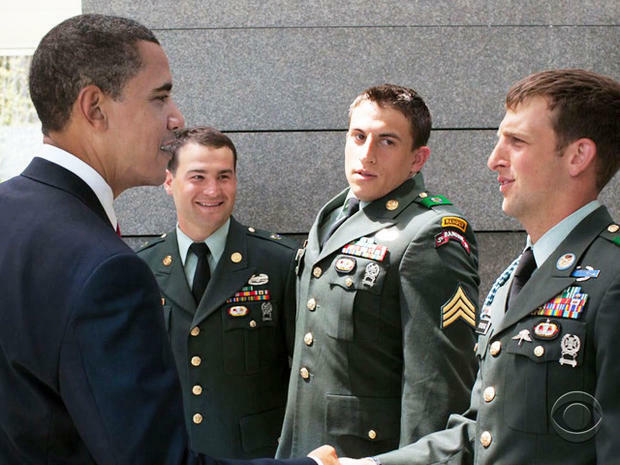 Cory Remsburg and President Obama met the 65th anniversary of D-Day. It was three-and-a-half months before he came out of a coma. “It took probably seven to eight months before he could speak,” Craig says. In February 2010, while recovering from surgery, he had a visitor. “At that time, I could not tell which way was up,” Cory says, let alone that the visitor was the President of the United States. And then there was that incredible moment at last week’s State of the Union address. Cory stood again, and all the leaders of a notoriously divided government gave him the longest standing ovation anyone can remember. “Here was this opportunity for everybody to agree on one thing, and that one thing was this wounded warrior in the balcony,” Craig says. And what does Sgt. 1st Class Cory Remsburg think of the extraordinary service he has given his country? We all know it’s not a perfect world, but Cory Remsburg just might be a perfect soldier. But the president spotted a picture in Cory’s room and realized they had met before, at the 65th anniversary of D-Day. Last August, they met for a third time. This time, he knew it was the president. He showed the president he could stand and, with help, walk across the room. It’s been more than four years since a roadside bomb in Afghanistan nearly killed First Sgt. Cory Remsburg. For the first two years three months of his recovery, at least one member of his family was with him 24/7. To do that, his step mother had to quit her job. The Army pays Cory’s medical bills, but it can’t cover all the expenses a family incurs dealing with wounds as severe as Cory’s. Fortunately, there are charitable organizations which can and do. 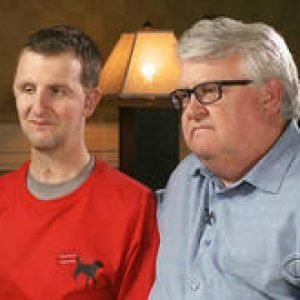 We asked Cory’s father Craig to list some of the organizations which are helping the Remsburg family with everything from remodeling a home to meet Cory’s needs to training a service dog which would have cost about $70,000. Lead The Way Fund: Assist with Army Rangers in many facets, building homes for wounded warriors. The Joshua Chamberlain Society: Assist with severely wounded warriors or KIA; adopted wounded warrior or children of KIA. Jared Allen’s Homes for Wounded Warriors: NFL football player building homes for wounded warriors. The White Heart Foundation: Assist wounded warriors & first responders in community. The American Service Animal Society: Not-for-profit service dog training. Team RWB: Nationwide military reintegration to civilian life.